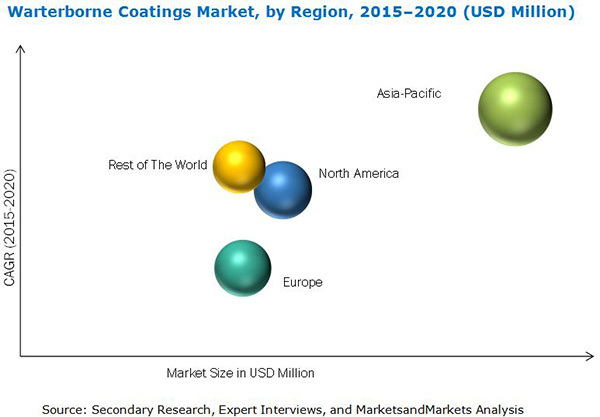 [190 Pages Report] The global waterborne coatings market, along with its applications, has witnessed a linear growth for the past few years and this growth is estimated to increase in the coming years. The properties such as hardness, stain resistance, flexibility, and corrosion resistance, and an upsurge in the demand in coatings, construction, automotive, consumer goods, electrical/electronics, textile, and industrial coatings will be the key influencing factors for the global waterborne coatings with an increased emphasis on its different applications and their end users. The Asia-Pacific market is projected to register a high CAGR in the next five years and offer significant commercial opportunities for the waterborne coatings market players. Many automobile manufacturers are setting up or expanding their manufacturing bases, especially, in China to take advantage of the low manufacturing costs. Asia-Pacific has been a bright spot in the global waterborne coatings market in the backdrop of the overall slowdown in global economic development. The applications of waterborne coatings are in architectural, automotive, and protective coatings industries. Concerns for environmental, health, and safety issues are driving the demand for waterborne coatings in the above mentioned applications. Currently, waterborne coatings are replacing solvent borne coatings in many specialty applications. In view of this, waterborne coatings are expected to hold a major market share in the overall paints and coatings market. Competitive scenarios of the top players in the waterborne coatings market have been discussed in detail. We have also profiled leading players of this industry with their recent developments and other strategic industry activities. These include key waterborne coatings manufacturers such as Akzonobel N.V. (the Netherlands), Axalta Coating Systems(U.S.), BASF (Germany), Berger Paints India Limited (India), Kansai Paint Company Limited (Japan), Nippon Paint Company Limited(Japan), PPG Industries Inc. (U.S.), RPM International Inc. (U.S.), The Sherwin Williams Company (U.S.), The Valspar Corporation (U.S.), and Tikkurila Oyj (Finland). This research report categorizes the global market for waterborne coatings on the basis of application, resin type, and region along with forecasting volume, value, and analyzing trends in each of the submarkets. Each resin type is further described in detail in the report with volume and revenue forecast. Each application is described in detail in the report with volume and revenue forecasts. The waterborne coatings market is estimated to reach USD 75.29 Billion by 2020, signifying a CAGR of over 5.05% between 2015 and 2020. The drivers identified for the waterborne coatings market are environmental concerns, increasing awareness among consumers, and growth in its applications areas. Architectural is the largest application of waterborne coatings. The architectural industry is driven by rising urbanization in Asia-Pacific and RoW, which resulted into increased demand for residential, commercial, and industrial infrastructure. Low interest rates on housing loans are also responsible for increase in the demand for new houses, eventually driving the architectural coatings segment. The acrylic resins type accounts for the highest share in terms of volume of the waterborne coatings market. The demand is expected to be the highest in Southeast Asia due to the growing automotive and construction sectors. As the region is witnessing high growth in the construction industry, there is high demand of acrylic-based waterborne coatings. Moreover, the demand for waterborne acrylic-based coatings for vehicles has been gradually increasing as some automobile manufacturers, such as Toyota, Honda, and Hyundai have started applying water-based systems in their new product lines. Currently, the Asia-Pacific region is the largest market for waterborne coatings and is estimated to record the highest CAGR. The countries such as China, India, and Japan are expected to lead the Asia-Pacific waterborne coatings market, with China accounting for the largest share in the regional demand in terms of volume of waterborne coatings. The demand of waterborne coatings is comparatively low in the RoW region, but is estimated to witness a moderate CAGR between 2015 and 2020. Uneven enforcement of existing government environmental regulations, availability of cheaper substitutes, sensitivity of waterborne coatings, which reduces the performance of waterborne coatings, are restraining the growth of the waterborne coatings market. The waterborne coatings market is highly competitive, with key market players, such as BASF SE (Germany), AkzoNobel N.V. (Netherlands), Axalata Coating System LLC (U.S.), PPG Industries (U.S.), The Valspar Corporation (U.S.), Sherwin-Williams Company (U.S.), and Nippon Paints Co. Ltd. (Japan), having a sizable share in the global market. Expansions, mergers & acquisitions, new product developments & launches, agreements, partnerships, and joint ventures are some of the key strategies adopted by the market players to expand their global presence and product portfolio. Maximum number of market activities took place in 2015 and 2014. The leading players, such as BASF SE (Germany), AkzoNobel N.V. (Netherlands), Axalta Coating Systems LLC (U.S.), and PPG Industries (U.S.) contributed mainly in terms of number of developments. Expansion, new product launch, and merger & acquisition were also the key strategies adopted between 2012 and 2015. 11.8 Nippon Paint Co. Ltd.
11.9 Kansai Paint Co. Ltd.
11.11 Berger Paints India Ltd.